I had no idea when I made this yesterday that today, AUG. 31st, was NATIONAL BACON DAY. 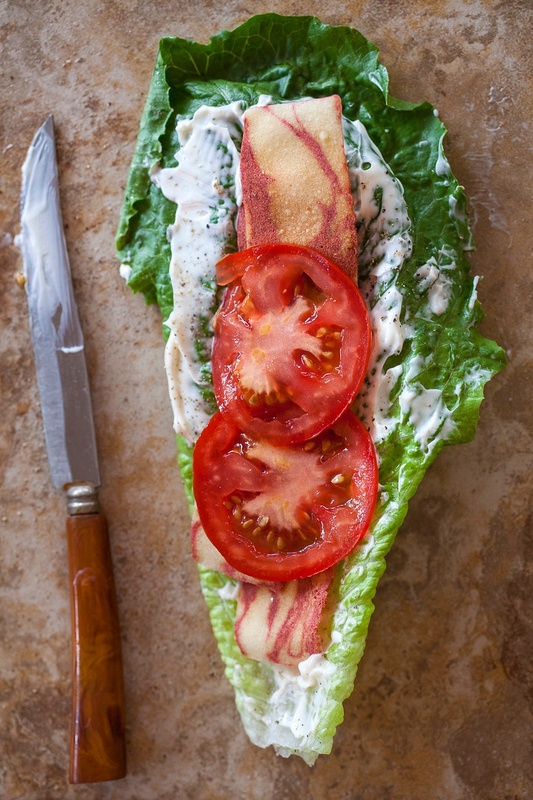 All I had been thinking was how the BLT is the perfect end-of-summer meal. Tomatoes are at their best, and something about the heat and humidity of the Arizona monsoon season makes me almost totally inert and immobile. This is about all I can muster dinner-wise, so I’m lucky that it’s fairly healthy… It turns out that mayo and bacon are better for us than expected, and my versions is also low-carb. 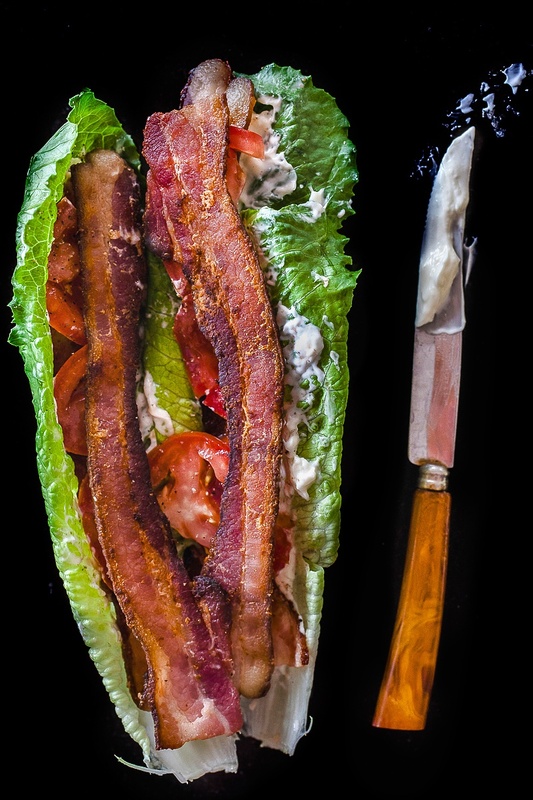 I prefer to ditch the bread in my BLT because it really just gets in the way (which might be why it’s not called a BBLT). Instead, I make mine “protein style” served stuffed in the hollow of a big piece of romaine lettuce for more of the stuff that I really want. Spread each lettuce leaf with a generous portion of mayo. 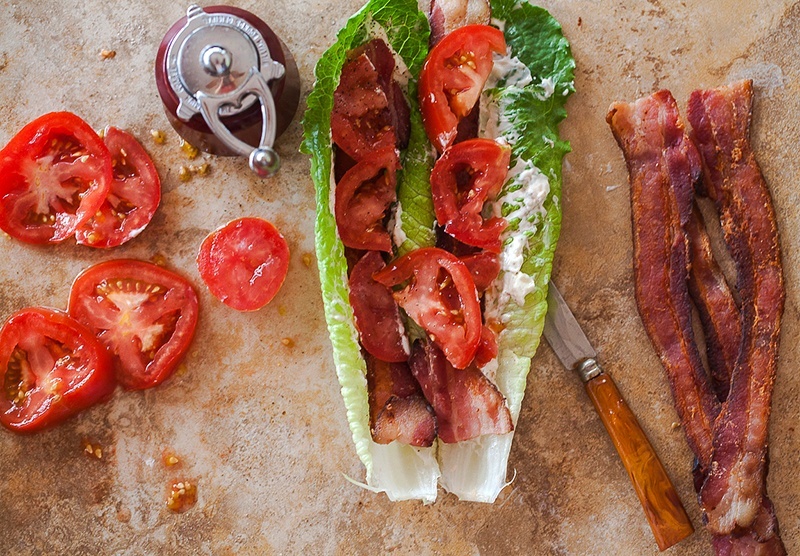 Top with two strips of bacon, then a layer of sliced tomatoes, and two more slices of bacon. Your pictures are fabulous. I had to fix this for lunch. Thanks for reminding us of such a classic combination in such a great way! I’ve been eating this all week! 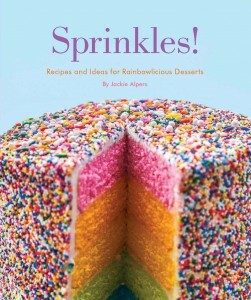 I made three of these for breakfast this morning and thoroughly enjoyed them. I left out the mayo and used avocado in it’s place. Wow! Thanks for the idea! Your photos are out of this world good! Also, this bacon wrap doesn’t look too bad either! Absolutely fabulous! This is wonderful without bread! I agree, more of what’s important without bread getting in the way. Also, paleo-friendly! Brilliant idea. Love BLTs, not so much the carbs. This is today’s lunch. Wonderful reminder that we don’t need the bread! Looks delicious. Pictures are beautiful. Making this for lunch tomorrow at the beach. Aloha: These are great. I love them with basil and red onion also. Sometimes put in watercress for bite. So many great ways to love these. I’ve made this, with two changes. 1) Avocado oil mayonaise. Don’t use Best Foods or any of those mayonnaises with vegetable oil or canola oil, it’s bad for you. 2) Add some slices of avocado. Yummy! Whole30 Meal Plan || Week 3 - The Effortless Chic - A lifestyle blog bringing easy ideas for every day style to you, every day of the week!